Sull'SR-71 ormai si è detto tutto, o quasi, magari è ancora classificata qualche missione, ma oggi voglio proporre qualcosa che non ha nulla di segreto. Si tratta di una foto che ormai ha qualche anno e che è stata scansionata da una copia originale cartacea, riprende il Lockheed SR-71 durante l'atterraggio al salone Internazionale di Le Bourget in Francia nel 1975. 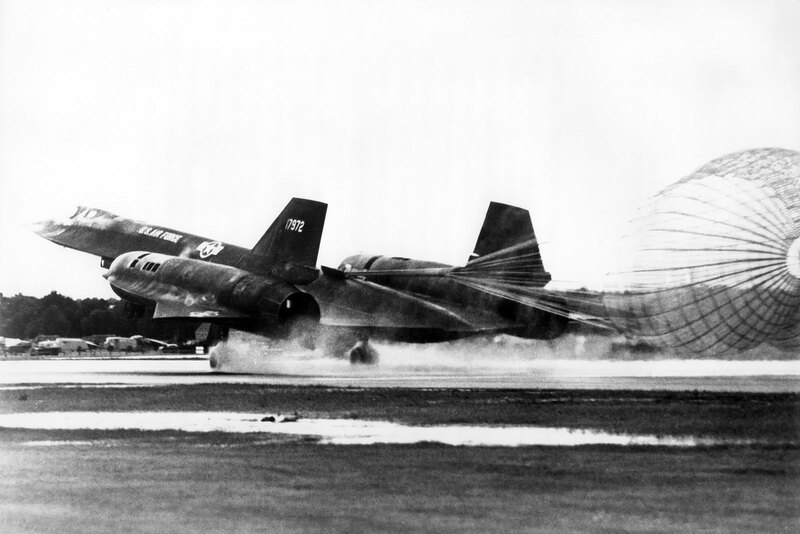 Braking chute helps slow Lockeed SR-71 high altitude reconnaissance aircraft after tochdown. Flown thousands of the miles by the US Air Force at or above Mach 3 since it became operational in 1966 , the SR 71 pioneered sustained operational flight at altitudes above 80.000 feet and at speeds in excess of 2000 miles for hour. The aircraft, which is made of titanium metal to withstand the blistering heat generator by its cruise speed, is a product of C L (Kelly) Johnson's famous "skunk Works" design group. The Blackbird owns a number of significant world speed marks. It flew a nonstop 15.000 mile, 10 1/2 hour flight to win the 1971 Makay Trophy for "most outstanding international achievement in the art/science of aeronautics". Last September another SR-71 set a new transatlantic world speed record of 1 hour, 55 minutes, 32 seconds on a flight from New York to London. Average ground speed was 1817 miles for hour for the 3470 statute miler run. The same Aircraft with a different crew established a world speed record of 4 hours, 47 minutes and 39 second on its return flight from London to Los Angeles. Average ground speed for the 5463 statute mile return flight was 1438 miles for hour.